Using Skype as a medium for generating temporally destructive portraits and self-portraits, Hallier redefines portraiture for the digital age. 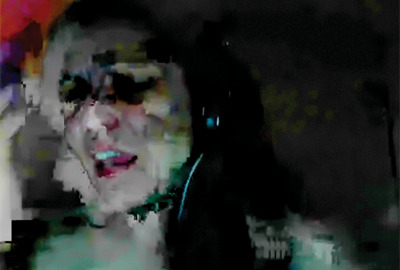 The show documents and comments on 80 long-distance conversations Hallier conducted online with 7 friends and family members throughout the past year using the software Skype*. The economy and facility of exchange are offset by the periodic disruptions in the flow of information that reveal the underlying technology of an otherwise seemless medium. A series of large prints capture moments of technological mishaps, producing a powerful and dramatic aesthetic that lies somewhere between impressionism and abstraction. According to Hallier: "While the element of chance conveys an iconic quality to each portrait, the distortions reflect our distance. We're used to the power of technology erasing the difference of time and space between us, yet here the defects visually transform each interlocutor into a fascinating deformed stranger." Computer technology, like an extension of our brain, offers great tools to archive, organize, and visualize information, yet its limitations betray our own. I find the restrictions and the flaws of technology to have aesthetical qualities and meanings that deny the perfection we want machine to emulate. They reconnect us with a sense of mystery tied to our human condition. I am interested in exploring conceptually and visually the confrontation between the human and the technological. Through practices and rituals like taking a picture a day, cataloging every object I own, or documenting over time my long-distance conversations with friends and family -- each project confronts intimate and subjective data concerning my life and others with the systematization of my actions, the systematization of technology, and with the codifications of cognitive sciences. By emulating the processes of technology and by working with it directly, my work aspires, through each project, to render the systems and patterns that describe a contemporary character. The resulting portraits or self-portraits reveal in turn the intimately technological and the systematically human. Hallier has presented at Siggraph (USA), Ars Electronica (FINLAND) and Anima Mundi (BRAZIL), ACM MM Arts Program (ENGLAND) and at SCAN Arts Symposium (USA). Two person exhibitions include "Body Chronicles" at the CAS Arts Center, NY (oct.-Nov.09), "Waiting Fields" At Brooklyn Front Gallery, NY, and upcoming show at Nadania Idriss Gallery, Berlin, Germany (Aug.-Sept. 2010). Group shows include "Nimbi Penumbrae" at the Dumbo Arts Center, Brooklyn NY reviewed in New York magazine, "Moon Tornado" at the Rose Wagner Blackbox SLT, UT, "Artists from RUMBO" at the Tribes Gallery, NYC and bCOOP and The Beacon Art Salon in Beacon, NY. Hallier’s work has been featured in The River Reporter (NY, USA), Style Magazine (Germany), the Village Voice, Telegraph (UK), High Color Magazine and Mondo 2000. She lives and works in Brooklyn NY.